We offer a range of exclusively designed Corporate Gifts to our clients. To meet the needs of our clients we offer customized solutions of the gift products. Gift items being offered by us are manufactured using finest quality raw materials. Every product that we offer is quality tested by our quality analysts at each stage of production. Assisted by a team of experienced and dedicated professionals, we are offering an extensive range of Decorative Marble Plates. 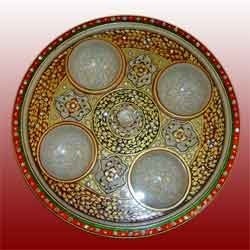 These dazzling white Indian marble plates are made from fine marble which display stunning mythical artwork. The manufactured items have gained wide acclaim due to excellent designs, superior quality, beautiful colors and durability. Our marble plate is checked by skilled workforce so as to deliver a defect free range.